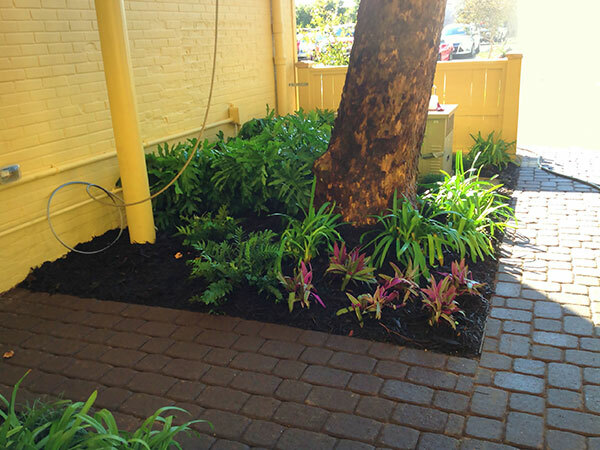 Commercial Landscape Design Case Study - Executive Landscaping, Inc. While the area back behind the Global Grill was once largely considered a service entrance and storage area where the detritus of things like garbage cans, cleaning supplies, extra chairs and tables, and a hodge-podge of other restaurant items that really didn’t have a dedicated space were amassed. 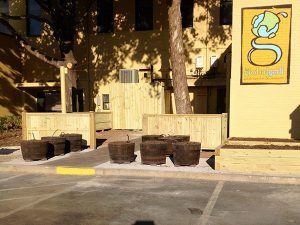 Also, parking at the front of the restaurant became a challenge and led to use of the rear lot area as additional parking meant that the obstacle course created by the restaurant’s run-off became both an eyesore and a liability. 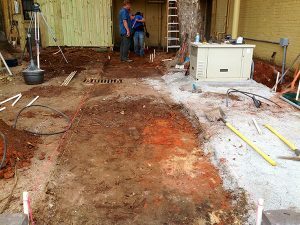 Recognizing the need to freshen things up and make it safe for public use, the owners of Global Grill came to Executive Landscaping, Inc., to help them convert their landmine into a gold mine. 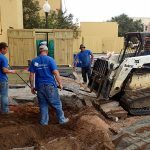 With our expertise in landscape design for small spaces and our years of experience creating custom landscaping for businesses all over the coast, we could recognize the potential that lay just underneath their problems. 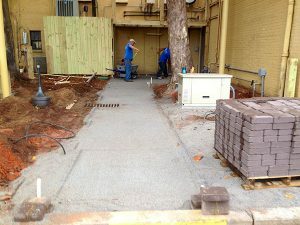 In addition to the mess being barely hidden by a privacy fence, there was also the issue of an uneven sidewalk that was full of trip hazards as well as overgrown vegetation, low hanging branches, and dark areas that became safety and security concerns at night. 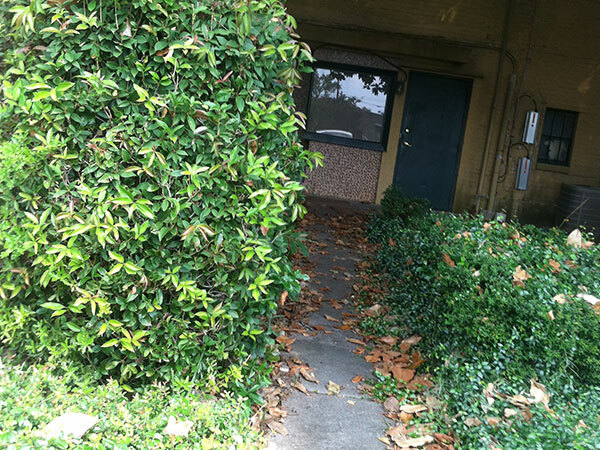 Nature was, in fact, an enemy in more ways than one, as a lack of any sort of awning or overhang from the roof meant that rainy days left anyone using the back exit soaked in rainwater. 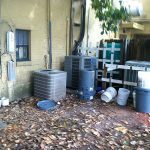 Increasing the lack of asthenic appeal to anyone coming or going through the back was the presence of kitchens exhaust fans and tankless hot water units residing above the back door or the generator, all of which were very much in view. Each of these utilities needed to be accessible, of course, but at the same time, they also needed to be concealed from customers in some way. 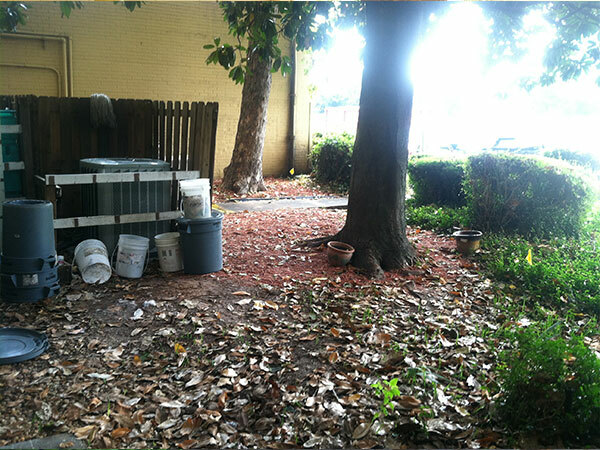 Nearby shade trees did provide some small relief, both in terms of shading as well as concealment, but not enough. 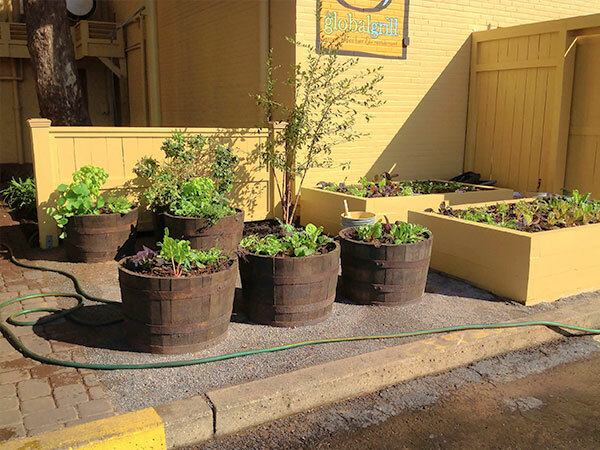 Additional considerations for the project were the head chef/owner’s desire to plant a completely organic garden for the purpose of growing, picking, and using fresh herbs and vegetables on the menu to supplement purchases from local organic farms. 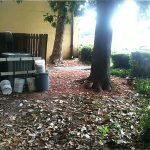 In our time of completing design for commercial landscaping, we have worked with a number of clients who dedicate an area of their project to organic gardening and knew that we could fully serve their needs. We were also tasked with housing their newly upgraded smoker equipment in a structure of some kind that would ensure its safety from theft and vandalism as well as protect it from the elements. 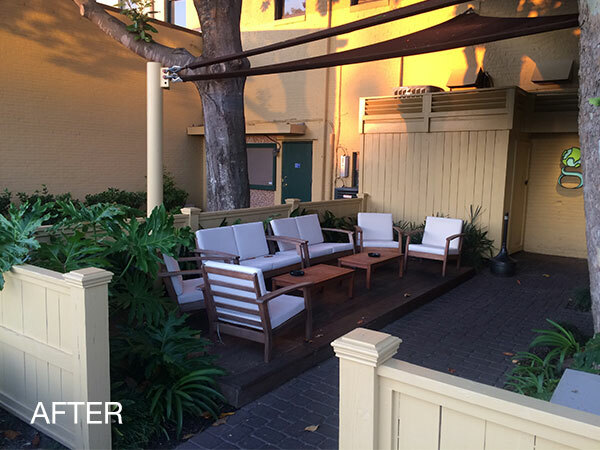 With the frequent usage of the back entrance by Global’s customers, it was ideal to convert the area to additional seating and entertainment space. 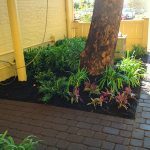 Our landscape design for small spaces such as this positioned us well to plan a beautiful setting where guests could socialize, have drinks while their table was prepared, or wait for other members of their party to arrive. As with any project relating to commercial services, we did face a number of challenges. 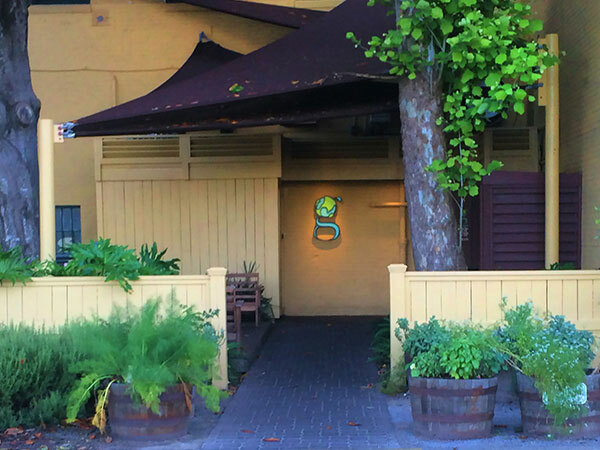 The restaurant leases the space from the building owner and is required to have the owner approve any changes made to the property but will not pay for those changes or improvements. 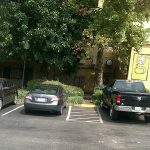 There was also a very tight budget with which to contend and tight space to work. 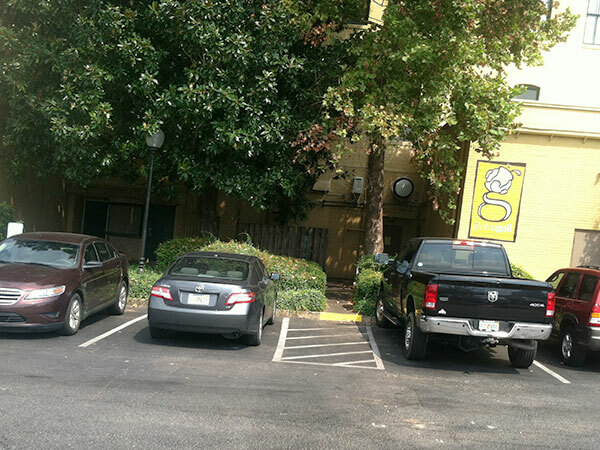 Our team could not disrupt the restaurant’s business or block access to the restaurant in any way during hours of operation, nor could we occupy more than a few parking spaces in the parking lot that is shared by multiple businesses or block traffic. Challenges related to the location were also present. 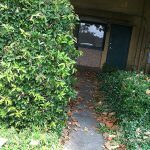 There was a large storm water inlet that needed to be covered without water flow or access being blocked, and a large telephone junction box for the entire building was buried under the overgrown shrubs. Fortunately, the solutions we provided Global Grill were extremely beneficial and met all of the challenges with which they presented us. We constructed a platform and stacked one A/C unit above the other and utilized the posts of the fence to support the enlarged stop, which extended the length of the restaurant and provided a safe walkable area above to service the equipment and a dry sidewalk below. 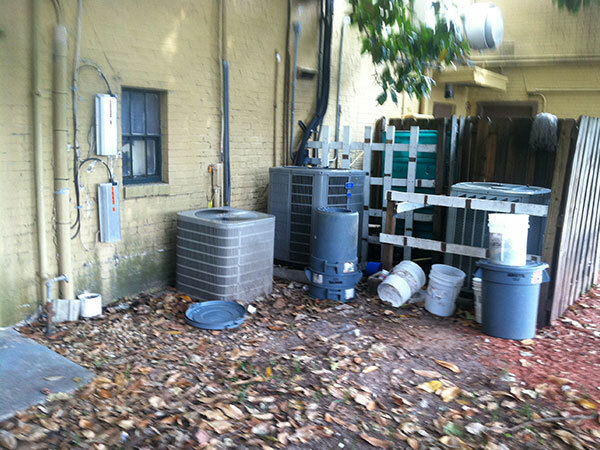 A louvered wall was installed above to hide equipment and allow ventilation, as well-- all of which reduced the square footage of the “utility and storage” area within the privacy fence. To continue blocking the equipment on the wall from view and constructing protection from rain, we created a shade sail. 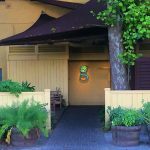 This involved engineering as well as the installation of footers, custom making poles, and custom cutting canvas to create the sail, which not only blocked the view but also diverted the rainwater runoff to the front pole and out of the way for people using the deck. 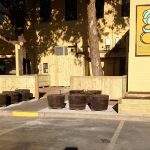 We used completely wasted overgrown space to create a second storage area for excess tables and chairs and to provide access for deliveries, which reduced traffic through the main entrance. To eliminate wasted space needed for the allowance of door swing on the fence, we created pocket doors and then tied the two individually-fenced areas together visually and created a separation from the parking lot to the gathering area by installing a single four-foot privacy fence and painting all of the wood to match the building. 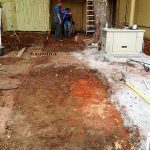 Along with these structures, we built an area to house the new smoker and installed a deck to create a gathering area and bridge over the storm drain. 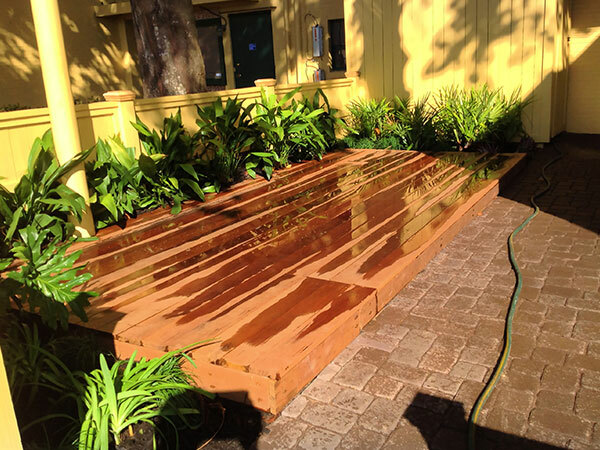 For access to the drain, we installed a trap door in the deck, which was built with a type of teak called kumara wood that is six times stronger than pine, will not rot, has the fire rating of concrete block, and has a harness that makes it impervious to insects. 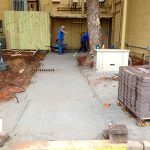 For the sake of aesthetics and functionality, we installed pavers for the sidewalk rather than pouring concrete. Pavers provide easier repair and maintenance and cause no damage to the root systems of trees. They also stand up to weathering and shifts in the ground more easily. 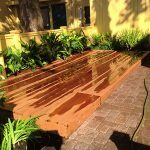 With our knowledge of landscape design for small spaces, achieving a balance between the organic garden and actual landscaping was quite simple. 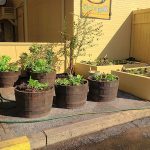 We installed drip irrigation to everything with the organic garden on a separate zone from the rest of the landscape and used 6”x6” pressure-treated wood timbers to create the raised organic garden and then filled them with decomposed organic matter. In order to continue the natural feel of the garden, we used decomposed crushed limestone for the walkways. 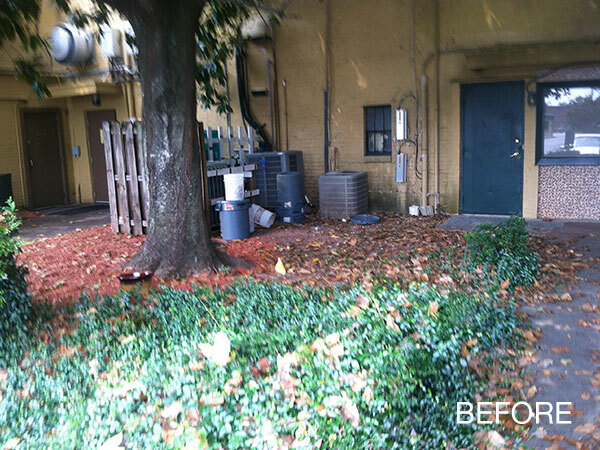 Need an expert’s touch in landscape design for small spaces? 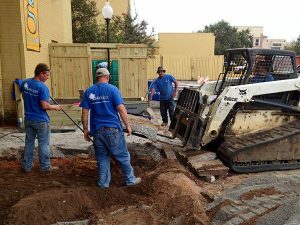 Call the team at Executive Landscaping, Inc., today to learn more!